Say the word Concorde and most who can remember will conjure up images of that marvel of aviation technology that took travellers hurtling through the stratosphere at twice the speed of sound. Here we are, well into the 21st Century and that era has come and now seems to have gone again. 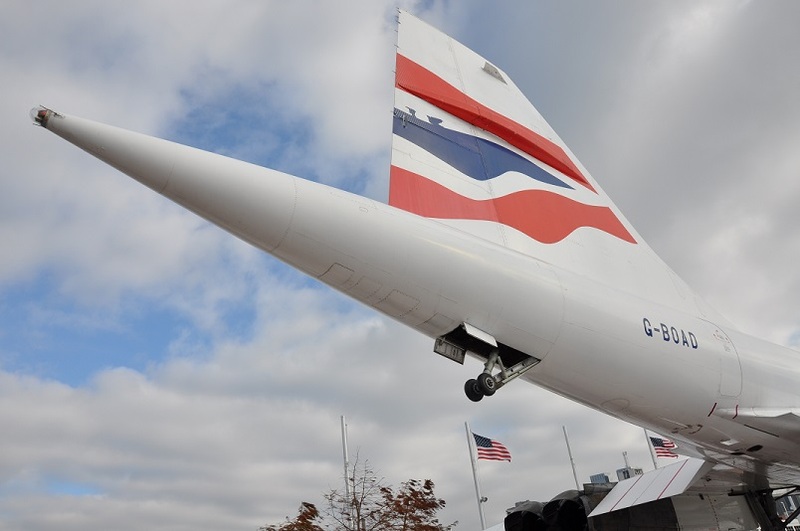 So what was Concorde? What was its story? To find this out, we need to go back over half a century to the 1950s. The Second World War was still fresh in the minds of most of the world and as with most wars, leaps forward had been made in many technologies. Aviation was certainly one of those technologies. The jet age had begun and imaginations were fuelled by new possibilities that could be realised. An early post of Concorde. Flying on one was certainly worth remembering and sharing. The beginning of the Concorde Project, although of course, Concorde was a name not yet even dreamt of, rather it was seen as the Super Sonic Transport (SST) project, had its beginnings when Arnold Hall the then Director of the Royal Aircraft Establishment (RAE) asked Morien Morgan to head up a committee to study the possibilities of SST. They first met in February of 1954 and delivered their findings in April of the following Year. Their findings were, that to achieve supersonic speeds and catering for the high amounts of drag at such speeds the wings would have to be short and rectangular, much like those found on missiles and some fighter jets like the Starfighter. At lower speeds the wings would not be very efficient and would require much longer runways or much more powerful engines. The landing speeds would be eye wateringly fast. The committee therefore determined that the SST concept was not really feasible. ……landing speeds would be eye wateringly fast…..
Not too long after this finding, Dietrich Küchemann and Johanna Weber of the RAE published papers on the concept of a delta wing. They maintained that the vortices that formed over the upper surface of the wing at high angles of attack, as in during take-off and landing when the aircraft is flying at low speed, created a low pressure area over the wing which aided in giving the wing the required lift at more acceptable speeds. This effect had been noticed before, notably by Chuck Yeager when flying the Convair XF-92, but never really studied in detail. To make use of this effect, the aircraft would be required to land and take off with a very high angle of attack, which is with its nose pointed very high above the horizontal. This in turn would require much longer landing gear struts so that the tail didn’t slam into the ground. Never the less, they were onto something. British Airways flagship Concorde. Its registration G-BOAC was the original name of the airline, British Overseas Airways Corporation. The Delta was definitely the design to go with, but that led to further research required about how to control the centre of gravity and the centre of lift. Trials were made with a straight leading edge, a Gothic leading edge where the leading edge curved outwards and an ogival or ogee leading edge where the leading edge curved inwards. The ogee was the one that produced the right results that would be usable on the SST. ….. top speed would be held to Mach 2.2……..
speed would be held to Mach 2.2. To further manage the skin temperature, a special white paint was used to reduce the temperature by around 6 – 11C. To illustrate the difference. One Concorde was painted in Pepsi colours (blue) for a promotion around the Middle East. During this time, this Concorde could only fly Mach 2.2 for periods of 20 minutes, it then had to drop back to a maximum of Mach 1.7. Fuel was also used as a heat sink by being pumped to heat affected areas and using the residual heat to aid the cabin heating. Of course when things heat up they expand. During cruise Concorde’s fuselage would grow by nearly 30cm (1 foot). during cruise, Concorde would grow by 1 foot…. This was most noticeable at the flight engineers workstation where the panel would separate from the bulkhead. 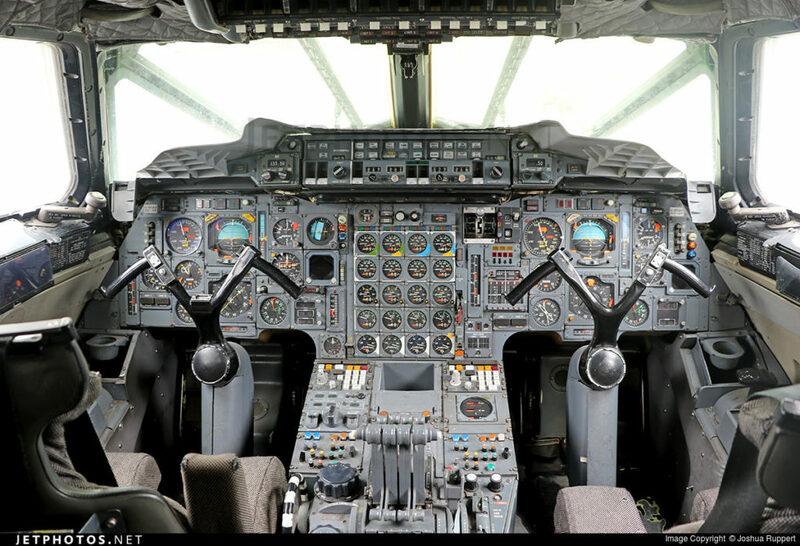 It is said that during the last supersonic of each Concorde the flight engineer dropped his hat into the space and on descending the hat would be permanently encased as the space closed up again. Air France Concorde on approach to land. Note the long landing gear to enable high angles of attack on landing and take off.
. At altitudes around 50,000’ to 60,000’ the atmosphere is very thin and the protective layers between the passengers and the sun were severely reduced compared to our normal ground dwelling environment. Skin cancer was a real concern and to this end a radiometer that measured radiation was installed in the cockpit. During high sunspot activity if the reading become too high, Concorde could be descended to a safer altitude below 47,000’. The French were also pursuing the SST concept and their government asked for designs to be provided by their own Sud Aviation and Nord Aviation as well as Dassault. Strangely enough all three came back with designs based on the Dietrich Küchemann and Johanna Weber slender delta design. Sud Aviation was chosen and in April 1960 Pierre Satre the company technical director flew to Bristol to seek a partnership. There was some surprise in Bristol that the French design was so close to their own. It turns out that some details of the English design had been leaked to the French. More than likely a little sweetener as Britain was trying to enter the European Economic Community (EEC) or Common Market as it was known. The main barrier to Britain joining the EEC was France or more particularly President Charles de Gaulle of France. Both parties agreed on most points, other than the French wanting a smaller version whilst the British were looking for a 150 seat version for the North Atlantic. At first it was thought the larger British version would require 6 engines whilst the French smaller version could be operated with 4 engines. This was solved by the development of the Bristol Siddeley Olympus which provided enough power to enable both options with 4 engines. There was much debate around the pros and cons of the economics of the project, however, the one big factor was the fear of not coming first to market and therefore missing out on the expected boom expected for the SST space. This was more of a national collaboration than a partnership between two companies. A draft treaty was signed on 29 November 1962. The name Concorde was chosen as in French it means agreement, harmony or union, as does the English version concord. There was consternation in England at the use of a French word but the then Minister of Technology, Tony Benn was quick to point out the “e” stood for England and excellence. It was changed to Concord but then later back to Concorde. Not the Concorde or a Concorde but just Concorde like it was someone’s name. British Airways Concorde G-BOAC on approach. 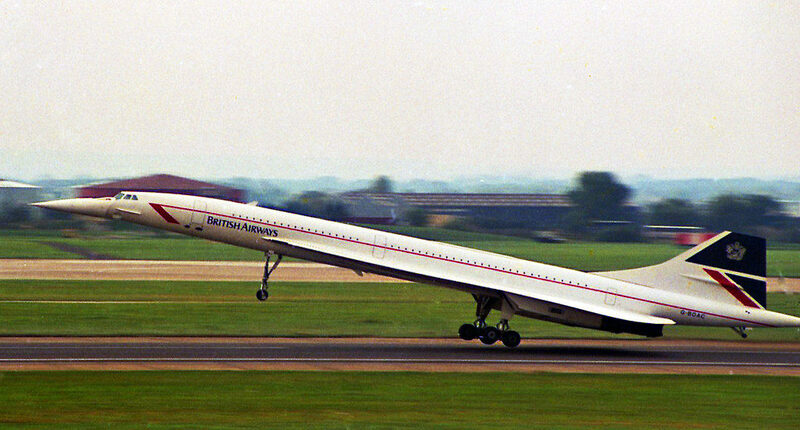 Concorde was seen as a most ambitious undertaking if not a flawed one. The development costs spiralled out of sight. Other factors also added fuel to the fire burning the platform from under the Concorde project such as the 1973 oil crisis followed by the 1973/74 stock market crash. The aviation scene was also changing. Aircraft such as the Boeing 747 and the McDonnell Douglas DC-10 were setting a new trend for lower airfares. This had not been factored into the SST equation. The sonic boom was a problem as it caused problems flying over populated areas, as was the pollution. The final straw for many airlines was the break-up of the Russian Tupolev TU-144 (dubbed Conkordski) over the Le Bourget Paris air show of 1973. It caused a lack of faith in the new technology. At the time of the first flight of Concorde there were 16 airlines who had pencilled in 74 airframes. BOAC (British Overseas Airways Corporation, forerunner of British Airways) and Air France were the only airlines to take up their orders. The airlines that placed orders are shown below in order of the date they signed for the option to take Concorde. Concorde – Tail bumper wheel G-BOAD. This wheel protected the fragile tail cone from being slammed into the ground in the case the captain overcooked the take off rotation. In all, 20 Concordes were built. Two prototypes were built to as quickly as possible prove that the theories about SST were correct. One was French and one British. The first to fly was the French Concorde, airframe 001, which took place from Toulouse on 02 March 1969. The aircraft flew 812 hours of which 255 were supersonic. In 1973 Concorde 001 was modified with roof top port holes to enable her to be used for the observation of a solar eclipse over Africa. It was the longest observation of a solar eclipse at 74 minutes. She was retired to the French Air Museum at le Bourget on 19 October 1973 after 397 flights. The British prototype made its first flight on 09 April 1969 from Filton to RAF Fairford. After completing 438 flights for a total of 836 hours of which 196 were supersonic, Concorde 002 made her last flight on 04 March 1976. She was retired to the Fleet Air Museum at RAF Yeovilton. With the lessons learned from the prototypes, modifications were made to the design. The wing design was modified, more fuel capacity was added as well as improvements to the engine air intake design. Details of these two airframes, 101/102 can be found below. Two production aircraft, 201/202, were built. These aircraft contained all the modifications required as a result of the strenuous testing of the prototypes and pre-production aircraft. These airframes were a representation of the finished product that would be rolled out to customers. Their purpose was to be used to gain certification of the type. Details of these aircraft can be found in the table below. Concorde Interior of G-BOAG. 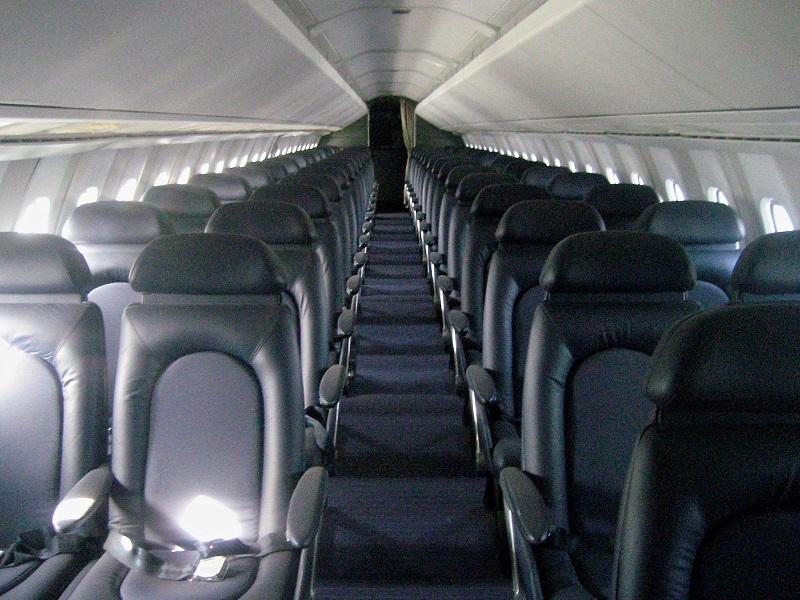 The cabin of Concorde was relatively small due to the necessary sleekness of the fuselage. The windows were also very small so as not to compromise the hull strength at then high pressure differential at cruise altitude. Also smaller windows would reduce mass decompression in the case of one failing. Following certification, 14 more production aircraft were build, 7 each for Air France and British Airways. Summary This was the first Concorde to fly and was later modified as mentioned earlier with rooftop portholes to observe the solar eclipse of 1973. It was the longest observation of an eclipse at 74 minutes as she streaked across Africa. She completed 397 flights which included 255 hours at super sonic and was the first of the 2 prototypes. Summary This was Britain’s first Concorde and the second prototype. Her first flight was from Filton to RAF Fairford. She completed 438 fights with 196 hours at super sonic. G-AXDN 101 17 Dec 71 20 Aug 77 575 Duxford Aviation Society. Summary G-AXDN was the first of the pre-production aircraft. The two pre-production aircraft included modified designs with lessons learned from the prototypes. These included a modified wing form, greater fuel capacity and an improved engine intake system. This airframe flew 273 fights with 387 hours at super sonic. F-WTSA 102 10 Jan 73 20 May 76 656 Orly Airfield, Paris. Summary This Concorde, the second pre-production aircraft, was the first to carry the features and shape of the future production aircraft. She was also the first to fly to the U.S. when she went to Dallas, Texas on 20 Sep 73. For some of her life she was painted with Air France livery on one side and British Airways livery on the other. F-WTSA completed 314 fights which included 189 hours at super sonic. F-WTSB 201 06 Dec 73 19 Apr 85 909 Aeroscopia Mueseum, Toulouse. Summary Airframe 201 was the first of 2 production aircraft. Although they never went into passenger service, airframe 201 and 202 were used to gain type certification which would lead the way for the aircraft to begin commercial service. 201 flew 423 flights of which 339 hours were at super sonic. G-BBDG 202 13 Dec 74 24 Dec 81 1,282 Brooklands Museum, Surrey. Summary Airframe 202 was the first British production airframe, once again this was meant to gain type certification and never meant for commercial serivce. She flew 633 flights including 514 hours at super sonic. After retirement she was kept at Filton where she was used for spare parts. In 2003 she was moved by road to Brooklands Museum in Weybridge, Surrey. G-BOAC 204 27 Feb 75 31 Oct 03 22,260 Glass Hanger at Manchester. Summary This was the flagship of the fleet as it carried the BOAC registration of the airline name(British Overseas Airways Corporation.). G-BOAA 206 05 Nov 75 12 Aug 00 22,768 National Museum of Flight, East Fortune, Edinburgh. Summary This is the aircraft that flew in formation with the Red Arrows at the 50 years of Heathrow Airport celebrations on 02 Jun 96. Her last flight was as BA002 from JFK to LHR. It never received the modifications dictated by the Paris crash. Its final journey was overland to the Thames then by sea to Torness in Scotland and once again overland to the National Museum of Flight near Edinburgh. Summary Like BOAA, BOAB was never modified after the Paris crash. Her last flight was a postioning flight under the number BA002P from JFK to LHR. G-BOAD 210 25 Aug 76 10 Nov 03 23,397 Intrepid Sea, Air and Space Museum, New York. Summary For 3 months in 1977 and from 1979 to 1981, G-BOAD operated a joint service between Bahrain and Singapore’s Paya Lebar airport with Singapore Airlines. The aircraft sported a Singapore Airlines livery on the left side and a British Airways livery on the right. 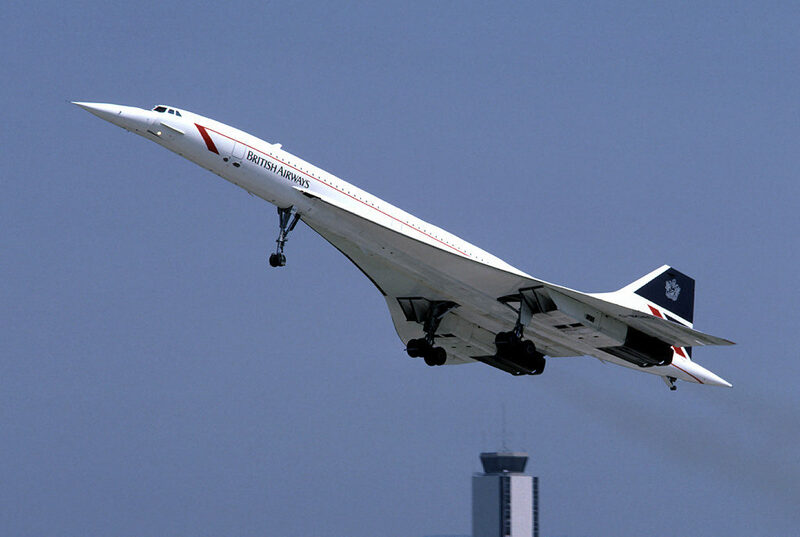 As well as flying more hours than any other Concorde, this aircraft set the trans-Atlantic speed record on a flight from JFK to LHR of 2 hours, 52 minutes and 59 seconds. G-BOAD’s last flight was to JFK where she was then barged up the Hudson to lay alongside the Intrepid. In December 2006 she was moved to Floyd Bennett Field where she was kept in poor conditions, including getting her nose cone knocked off by a truck. In 2008 she was moved back to Pier 86 in Manhattan and incorporated into the Intrepid Sea, Air and Space Museum after being restored. G-BOAE 212 17 Mar 77 17 Nov 03 23,376 Spencers Plantation, Bridgetown, Barbados. Summary G-BOAE was also privileged to have flown in formation with the Red Arrows aerobatic team. On 01 July 1999 she joined the display to commemorate the opening of the Scottish parliament. Her last flight was from London Heathrow to Grantley Adams International Airport in Bridgetown, Barbados. There were 70 members of British Airways staff and the flight reached its maximum rated altitude of 60,000 feet as well as completing the fight in under 4 hours. A specially constructed exhibition was made on the east side of the airport at Spencers Plantation. G-BOAG 214 21 Apr 78 05 Nov 03 16,239 Museum of Flight, Seattle. Summary This aircraft made the final Speedbird 2 (call sign for Concorde) flight from JFK to LHR on 24 Oct 03. Leaving Heathrow for the final time on 03 Nov 03, it flew to JFK where it stayed overnight. On 05 Nov it continued its journey to Boeing Field, Seattle. With special clearance the flight was permitted by the Canadian Government to fly super sonic as most of the flight was over unpopulated wilderness. G-BOAG is currently displayed at the Seattle Museum of Flight next to a 707 that was used as Air Force 1 and the prototype 747. G-BOAF 216 20 Apr 79 26 Nov 03 18,257 Aerospace Museum Bristol at Filton. Summary G-BOAF was the last Concorde to be built and also performed Concorde’s final flight. This flight departed Heathrow at 11:30am with 100 British Airways staff on board and headed out over the Bay of Biscay for a brief super sonic sector before doing fly bys over Bristol and surrounds. On landing at Filton at around 1pm she was met by Prince Andrew who was there to accept the handover. The aircraft was open for viewing at the Airbus facility until 2010 but in 2017 she became the main exhibit at the Filton Aerospace Bristol Museum. F-BSTC 203 31 Jan 75 25 Jul 00 11,989 Lost in Paris crash. Summary Featuring in the Airport 79 film, The Concorde, F-BTSC was the Concorde that was lost in the Paris air crash of 25 July 00 with 113 passengers and crew on board. F-BVFA 205 27 Oct 75 12 Jun 03 17,824 Steven F. Udvar-Hazy Center at Washington Dulles Airport. Summary This aircraft created a then world record by flying around the world in 41 hours 27 minutes. Summary On its last flight on 24 June 2003 this aircraft was destined to be displayed next to a Tupolev TU144(Concordski) at the Sinsheim Auto and Technik Museum, Sinsheim, Germany. Having paid 1 Euro for the airframe, it was flown to Karlsruhe-Baden-Baden Airpark. The tail fin and wings were removed so that the final part of the journey by road and barge could be completed. F-BVFC 209 09 Jul 76 27 Jun 03 14,332 Aeroscopia Museum Toulouse. Summary This aircraft is the last to have flown for Air France. Its last flight was to Toulouse and was supersonic. It included a go round at Toulouse where it was retired to the Airbus plant next to 201. It was moved to Aeroscopia in January 2015. F-BVFD 211 10 Feb 77 27 May 82 5,814 Broken up 1994. Summary This is the only Concorde that was scrapped before its retirement. Due to being left outdoors it was badly corroded. It was used for spare parts until finally being broken up in 1994. Summary The is the aircraft that in 1996 carried a promotional Pepsi blue livery. Only the fuselage was painted blue while the wings remained white due to heating factors. Due to heat, the aircraft was restricted to flying Mach 2.2 for a maximum of 20 minutes. For the rest of the time it was restricted to flying Mach 1.7. It is said that Pepsi paid around US$20 million for this publicity stunt. 16 flights around the Middle East were completed in this livery. F-BTSC also claimed 2 round the world records. West about on 12-13 October 1992 in 32 hours 49 minutes and 3 seconds and East about on 15-16 August 1995 in 31 hours 27 minutes and 49 seconds. She also set a speed record between JFK and San Jose, Costa Ricax, being the only Concorde to have visited Central America. F-BVFF 215 26 Dec 78 11 Jun 00 12,421 Charles de Gaulle Airport, Paris. Summary This aircraft was midway through refurbishment when the withdrawal of Concorde was announced. It was cosmetically reassembled and put on display at Charles de Gaulle airport. Its last flight was a charter into that airfield. The Concorde as we can see was a one-off design. 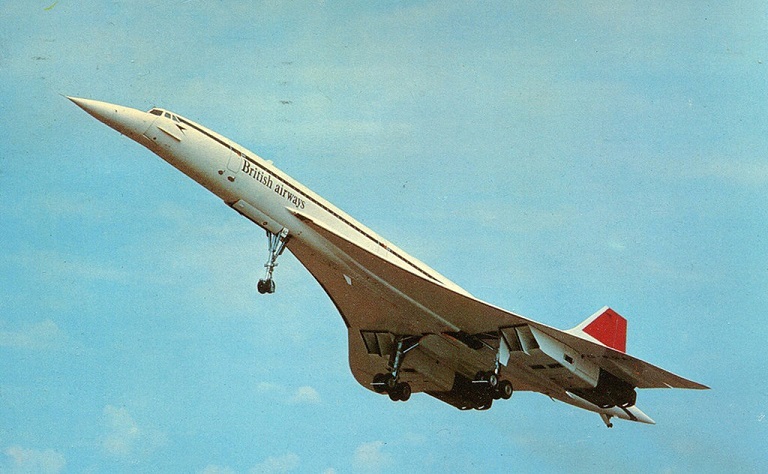 Other than the Tupolev TU-144 “Conkordski” which flew briefly on some internal routes in Russia, Concorde was the only SST (SuperSonic Transport) to make it off the drawing board and into the history books as a marvel of aviation. Below we can get an idea of what what made Concorde what it was and how it measured up. Passengers 92 in standard configuration or 120 in high density layout. Air France Flight 4590 – The Beginning of the End. At 16:43 on 25 July 2000, Air France’s first received Concorde F-BSTC sealed her fate as well as that of Concorde as a type, when she ran over some debris on the runway at Charles de Gaulle airport, Paris. Flying under a special flight number, AF 4590, she was a charter flight from Paris to JFK, New York. Chartered by German company, Peter Deilmann Cruises, the 100 passengers were to join their cruise ship, MS Deutschland, for a 16 day cruise to Manta, Ecuador. It is alleged that a Continental Airlines DC-10 bound for Newark, New Jersey 5 minutes before Concorde dropped a strip of titanium on the runway. Concorde ran over this on its take-off run which caused a tyre to be cut. Tyre debris was flung into the underside of the wing, not puncturing it but causing a shock wave that ruptured number five fuel tank at its weakest point, just above the landing gear. The resultant gush of fuel either touched a hot part of the engine or was sparked by a wire that was parted by the debris. Engines 1 and 2 both surged then lost power. Engine 1 slowly recovered. Engine 2 was shut down by the engineer on command by the captain. Air traffic control noticed flames coming from under the wing and informed Concorde. The aircraft had passed V1 and the captain decided to continue the take off. After lift off the crew were unable to close the landing gear bay door. This coupled with the reduced thrust of only 3 engines prevented the aircraft from being able to climb. The heat of the fire on the port wing caused it to start disintegrating as the metal started to melt. Once again Engine 1 surged and this time lost thrust never to recover again. The asymmetric thrust caused by 2 engines operating on one side and none of the other made the aircraft uncontrollable. It banked to 100 degrees and the crew reduced power to try and compensate. The result was the aircraft slowed further and reduced speed made the aircraft stall. The aircraft crashed into the Hôtelissimo Les Relais Bleus near the airfield. According to cockpit transcripts the crew was hoping to divert to le Bourget airfield. 100 passengers and 9 crew were lost on the aircraft as well has 4 employees from the hotel perished. All Concordes were grounded shortly after the crash pending further investigation. 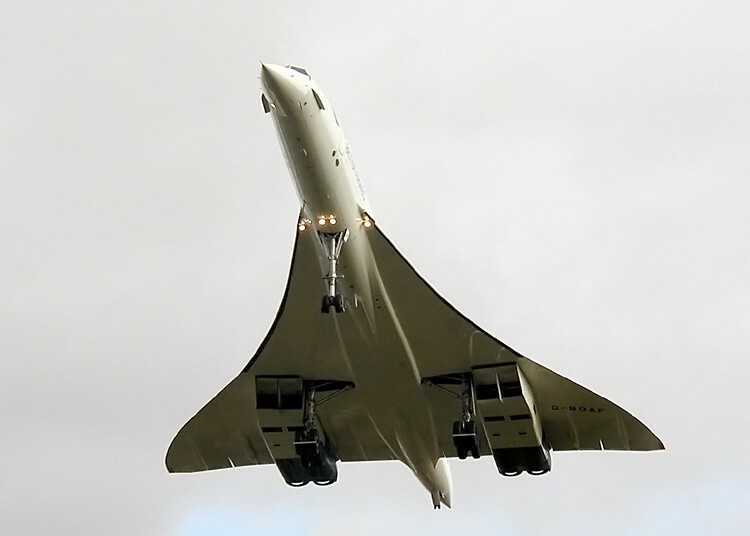 Once the cause was known, £17M of safety modifications were made to most of the Concordes and services resumed on 01 November 2001. Finally, all aircraft were retired in 2003. The heady days of supersonic flight were over and the pride of the French and British aviation industry sent to various museums and displays to be enjoyed and marvelled at by future generations. 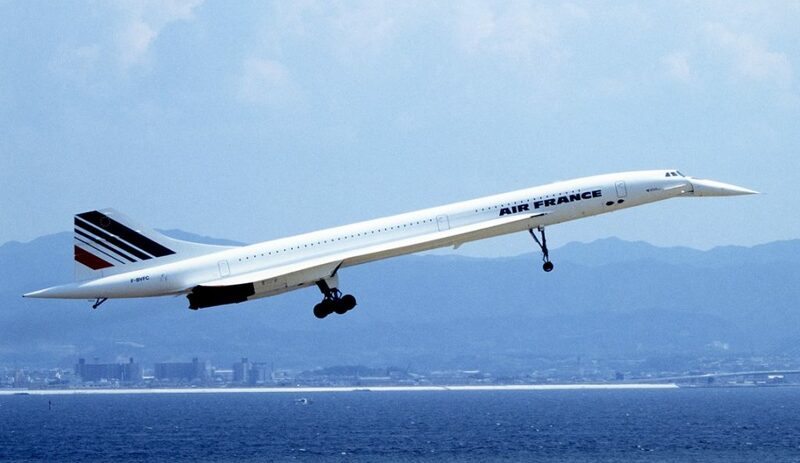 Air France’s Concordes were run at a loss but maintained as a matter of national pride. British Airways on the other hand managed to run theirs at a profit at an average of GBP30M per year. Maybe one day we will see the return of supersonic flight, however, it seems more likely that shooting ships into low orbit to reach their destinations in eye wateringly fast times may be the future of fast travel.